Why isn’t my air conditioner blowing cold air? Your air conditioning system uses refrigerant to create cold air. 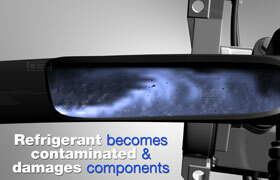 The most common reasons Port Coquitlam drivers lose their cold air have to do with the refrigerant. The first is not enough refrigerant. Refrigerant is a gas in the system and very small holes in a hose, seal or coupler can allow enough to leak out to prevent the creation of cold air. Another potential problem for Port Coquitlam auto owners is contamination. Over time the inside of the rubber hoses can deteriorate and little bits of rubber can clog up various filters and other vital parts of the vehicle A/C system, preventing proper circulation of the refrigerant. And a component could also be worn or broken. So the first step for Port Coquitlam drivers who can't cool their vehicle is a thorough air conditioning inspection, looking for leaks and worn parts. In fact, inspections are required before adding refrigerant. Some areas do not allow topping off a leaking system. Once any vital repairs are made, refrigerant is added. At the same time, special oil is added to the system. This oil cools and lubricates various components as it circulates along with the refrigerant. If you have a refrigerant leak, you also have an oil leak – and it's vital that both be replenished for proper function and protection of your A/C system. Sometimes overlooked by Port Coquitlam drivers is the fact that a worn serpentine belt (which drives the A/C compressor) leads to belt slippage which puts additional strain on the compressor. Replacing your serpentine belt and belt tensioner on schedule at Port Coquitlam Poco Napa Autopro will extend the life of your A/C compressor and other vital belt driven accessories. At Poco Napa Autopro we install quality NAPA replacement parts.